Breaking News: Secretary Frazier Goes to Kinshasa !!! The Situation in the Eastern Democratic Republic of the Congo is Spirialing out of Control. Rebel Forces have Driven the Congolese Army and UN Peacekeepers to the Outskirts of Goma the Provincial Capital of North Kivu. 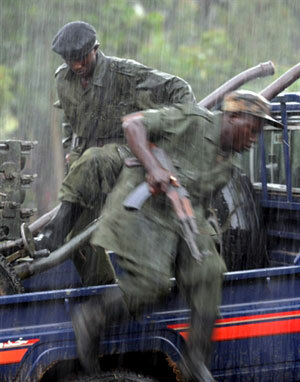 There has been a reported Firefight between the Congolese Forces and Rwandan Forces. There are reports that a BBC Correspondent witnessed the Incident. In Reaction the US is sending its Top Diplomat to Kinshasa to assess the situation. The United States has had an interesting History when it comes to the Democratic Republic of the Congo. The US had a long standing relationship with the Former Leader Mobutu Sese Seko. When the Intelligence Chiefs of the Above Mentioned Nations Meet the US Has a Presence at the Meeting. The US has stated that it is concerned over the Recent Upsurge in Fighting in the Eastern DRC. Plus there is word now that the US has Evidence that Rwanda is actively supporting the Rebel Offensive. Congolese Militia are now on the Outskirts of Goma. The top US Diplomat for Africa is on her way to the region. At a Press Briefing at the State Department A Spokesman Indicated that the Administration will support any and all efforts to restore Peace and Tranquility to the Eastern DRC. France which currently holds the Rotating Presidency of the UN Security Council is supporting a Plan that could have at least 6,000 EU Troops in the Area within a week. Currently the Plans for US Diplomacy has the Undersecretary Meeting with President Kabila on October 30th. Although a Date has not been announced Ms Frazier is expected to Hold Talks with the Senior Rwandan Leadership as well. There are currently no plans for talks with the Rebel Forces. For Details go to www.state.gov and the African Affairs Page.